Liselotte Frisk has worked at Dalarna University since 1999. She defended her doctoral thesis at Åbo Akademi University in Finland in 1993. The thesis dealt with New religiosity and new religious movements, such as ISKCON (Hare Krishna), Osho movement. Siddha Yoga, TM, and Anthroposophy. She has continued to do research on these issues, and also on the New Age concept. 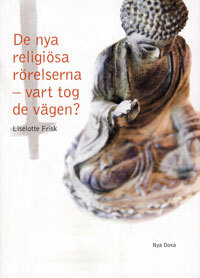 In 2007, Liselotte Frisk published a book entitled ”De nya religiösa rörelserna – vart tog de vägen? : En studie av Scientologi-kyrkan, Guds Barn, Hare Krishna-rörelsen, Moon-rörelsen och Bhagwan-rörelsen och deras utveckling över tid” (The new religious movements – where did they go? : A study of Scientology Church, God’s Children, Unification Church, and Osho movement). More information. Eva Hellman from the Dept. of History of Religion, Uppsala University, used to teach at these courses, but they are nowadays administered by Professor Frisk. Professor Emeritus Gudmar Anéer was appointed Professor of Science of Religion, with emphasis on History of Religions, at Högskolan Dalarna from September 2004. Before that, he was affiliated to the Dept. of Religious Studies, Gothenburg University. Gudmar Anéer defended his dissertation at Uppsala University in 1973 on a thesis called ”Akbar the great Mogul and his religious thoughts”, and he has continued to do research on the same subject. At Göteborg University he was engaged in a project on ”Kingship, Theology and Religious Politics of Akbar the Great Mogul”. Prof. Anéer presented a paper on ”Is There Such a Thing as a Religious Policy? The Role of Religion in the Policy of Akbar the Great Mogul” at the EASR-sponsored conference on ”Exercising Power: The Role of Religions in Concord and Conflict” that the Finnish Society for the Study of Religion and the Donner Institute jointly organised 17–19 August 2005.